Early sense of trust is not limited to having basic needs met, but also feeling safe in a variety of environments. As a caregiver, you have the opportunity to help infants form positive relationships with both humans and the natural world. Creating safe outdoor learning environments that offer infants and toddlers the opportunity to explore and experiment with the natural world must be combined with caregivers who are willing and able to let children interact with their environment and model that interaction themselves. Infants and toddlers are often thought of as “too young” to be involved in gardening, but they can be engaged through watering, harvesting, digging, and exploring worms, insects and birds. The best way to help these ages benefit from a garden experience is through their senses. Interactivity – Design sensory gardens to encourage interaction with the environment. Sitting, standing and climbing areas may include benches, logs, platforms, and bridges. Most interaction with a garden will happen at ground level, but a secondary level offers older infants and toddlers opportunity to “pull up” and explore. Create opportunities for children to move through the garden. Being “in” the garden is more engaging than looking “at” it. Consider a variety of places for the infants and toddlers to walk and move. Paths and defined areas may have different types of surfaces – sand, flagstone, wood chips, etc. – as well as a variety of inclines, steps, etc. Include a sand box and/or a designated “dirt digging spot” in a shaded area. Integrate a sensory garden throughout a playground area, intermixed with slides or climbing structures. Grow edibles. What better interactive sensory experience than eating?! Edible plants are not only safe features on a playground (ensure the whole plant is edible), but can also be integrated into meals or snack time to broaden the experience. Include classroom or outdoor activities in which children help create parts of the outdoor learning environment or garden. Even young children can help plant, make a scarecrow, create a mural, water plants, or scatter birdseed. Create child size places, such as vine covered hide-a-ways or tunnels. Sight – Color, shape, visual texture, movement, light and shadow. When planning year- round sensory experiences for children incorporate colors, shapes, light and special features throughout the year. Plant flowers of varying colors that bloom at different times of the year. Include red-leafed, soft, grey foliaged and variegated plant varieties. Make use of contrast, such as clustering plants of different shapes, sizes and colors. Consider planting long grasses or ‘weeping’ tree varieties that will move in a breeze. Include plants and features that appeal to butterflies, such as herbs or flowering trees and shrubs. Use trees and plants to screen visually unappealing areas. Choose trees and shrubs that attract birds (you can include a bird feeder on a branch) and that change their foliage in autumn. Consider the view from inside the classroom and include interesting plants, flowers, or birdfeeders that children can see from the windows. Potted plants don’t have to be confined to traditional pots. Be creative and use items such as old shoes, a wheelbarrow, or playground equipment. Integrate mobiles, mirrors or sculpture into outdoor environments. Include soft flowers, fuzzy leaves, springy moss, rough bark, succulent leaves, and prickly seed pods. Place plants and trees close to walkways so children walking along the path may be brushed by foliage. Don’t cut low-hanging tree branches unless they are a safety hazard. Some species offer a variety of textures within a single plant, such as a southern magnolia, with leaves slick, shiny, and dark green above, and soft, felted brown beneath. Intersperse rocks, wood, fabric or toys of different sized, shaped and textures. Smell – Smells don’t just have to come from blooming flowers. When planning a sensory garden for infants and toddlers, think about both strong and subtle smells that they may explore directly or indirectly. Plant flowers with subtle smells that require you to stick your nose into the petals, such as violets. Consider planting a non-slip creeper or herb on or near a path so that, when you walk on the plant, it will release a beautiful aroma – for example, thyme or mint. Don’t clump too many aromatic plants in the one area, as the confusion of different scents will be overwhelming. Space scented plants at intervals around your garden. Choose plants that are pollinated by birds or insects rather than plants that release their seeds into the air. This will help any children who suffer from hay fever or asthma. Introduce fresh mulches, wood shavings, grass clippings, etc. which may have new scents. Taste- A favorite sense. 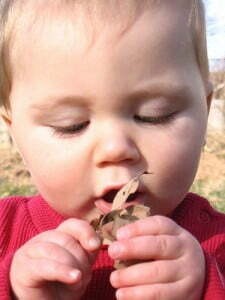 Everything in an infant and toddler garden should be edible, or at least non-toxic. Consider buying small fruit trees for your garden. Edible flowers are not only beautiful but safe plants for the playground. Grow veggies and herbs in your school yard and use them in cooking or sensory experiences in the classroom. Early introduction to fresh, healthy foods will have an important impact as children begin making their own food choices.